If you get itchy fingers whenever you do not have your Android phone in your hands to check up on new messages, updates and other things, then you may find it difficult to keep it tucked away while you are working on your computer. If you work on a PC throughout the day, you may not have time to look at your phone all the time. Or, you may not be allowed to use your phone at all while you are working. Desktop Notifications is an application for Android that you use in conjunction with a Mozilla Firefox add-on or Google Chrome extension. It uses the browser's desktop notification feature to display all notifications that you receive on your phone on the desktop. While you cannot react to it in any way, it at least lets you know about notifications so that you either know that nothing of importance has happened in the meantime or that you have received a notification that you need to react on. 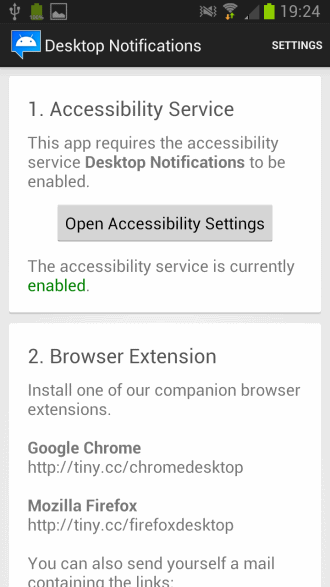 The installation requires you to install the Desktop Notifications application for Android on your phone or tablet first. The app highlights what you need to do next. First thing that most may need to do is enable the desktop notifications feature of the device. A button is displayed here that you can tap on to be taken to the preferences of the device where you can enable the feature. The phone displays a secret code that you need to enter in the browser extension that you plan on using. Simply install the Firefox add-on or Chrome extension on your system and click on the icon it adds to it afterwards. Here you can enter the secret code that is displayed on the phone to pair the two devices. Firefox users need to enter the code in the add-on's settings. You may also configure a couple of extra features, like the interval in which the notifications are displayed on the screen or sound notifications. 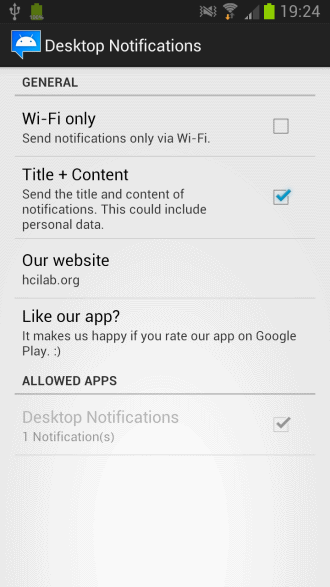 The Android app displays a test notification button that you can tap on to test the functionality. If everything has been configured correctly, you should receive the notification on your desktop. You may want to open the settings of the Android application before you start to use the feature full time. Notifications are by default displayed all the time, which you can restrict to Wi-Fi only if you want to save bandwidth. Both the title and content are displayed on the desktop by default, which may display personal information depending on the notifications you receive. This can be disabled in the preferences as well. 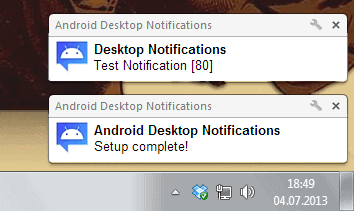 If you want to know about Android notifications while you are working on the desktop with Chrome or Firefox installed, then you may find the Android Desktop Notifications app and extensions suitable for that task. While it may sometimes be sufficient to just read the notifications, it needs to be noted that you cannot use it to reply in any way or form to it. For that, you need to access your Android device. My favourite in this genre is AirDroid. You get notifications in your browser and you get a ton of other features. I never even considered this. Cheers.